It’s chaos, insanity, it’s….pure madness. Toys R Us Canada is throwing an event so large that you’re just going to have to see it to believe it: the famous Moonlight Madness. With new deals and specials being released every hour, this event is only on March 22nd at starts at 6pm online and in-stores. But who wants to battle the throngs of people when you can easily shop at home in your sweats? Going to have to skip this event? No problem! Hit up our Toys R Us Canada offer page for all the best deals and steals. All of the deals end at 10pm both online and in-stores (though they end at 9pm in Quebec stores and where prohibited by local laws) and are available while supplies last. There are a plethora of offers and you can sneak a peak by clicking right here. Sales like these are the opportune time to start stocking up on gifts for Christmas for the little ones in the household. Have a little girl that is just itching for some Littlest Pet Shop toys? Grab them for 50% off the listed price during this sale! The Shimmering Sky Rainbow Cloud Pack drops down to $10 during this event. Have a little boy? No problem! 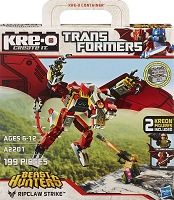 The Kre-O Transformers Ripclaw Strike set is also 50% off, dropping down to $9 during this madness sale. Dinosaurs and legos…that’s what boys like, right? Shipping is free with orders of $100 or more, so start making your lists now!